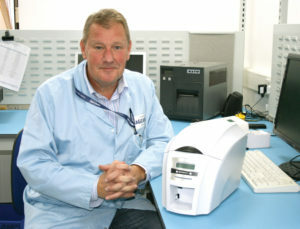 Graham Parkington is Magicard’s Production Supervisor and is based at the Weymouth, UK Headquarters. Prior to joining Magicard I worked at a healthcare manufacturing company making high-tech inhaler products, in Lancashire, for 24 years. I started as an operator on the shop floor and worked my way up through the company, eventually leading a team of 40 people. After that, my wife and I moved to the South Coast of England, which is where I found the role at Magicard. How long have you worked at Magicard? I’ve been working for Magicard for seven years. I’ve seen the company change so much in that time – for the better. When I first started, they were only building a fraction of the numbers they are now and it was clear to me that many improvements could be made in terms of cross-skilling and teamwork. I was employed as a Production Supervisor to help build the team up and the volume of printers being made. My primary role is to support the production team to achieve their daily production targets. Our team’s motto is ‘on time, in full and without defect’ and I believe we are good at that. My manager recognised that I have a wide range of skills that could add value to Magicard. I’m a team leader, I’m good at building teams and supporting them. My team is brilliant at hitting their targets, work well together and are a great bunch of people to work with. What are the biggest positives about Magicard as an employer? I think Magicard is a caring company where employees are valued. There are regular briefings so all members of each department are kept fully up-to-date on the company as-a- whole. It’s clear what’s expected of us. We now build up to 160 printers a day because we have a team who care and enjoy working for this employer. Is there a particular project you’ve enjoyed working on the most? Personally, I particularly enjoy the team building events and tasks. Since introducing a new training matrix, everyone now is multi-skilled, they can all do every aspect of building a printer. This is something I’m particularly proud of – helping my team to build on their skills and experiences. I’m happy in my job and happy where I am in the World. I’d still like to think I’ll be a strong team player, I think I bring something that a lot of people don’t, I’m quite pragmatic. One day I’d like to move to Portugal, but at the moment, as long I’m continuing to do what I do then I’m happy.